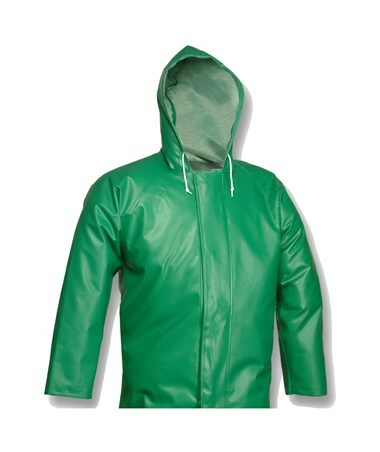 The J41108 hooded jacket is flame*, chemical, and mildew resistant, and waterproof. 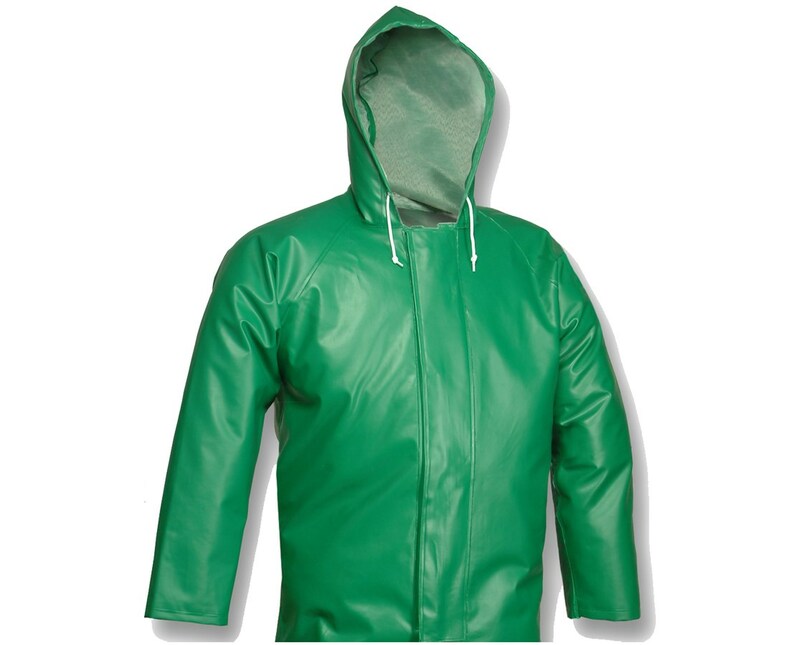 the PVC coating over polyester fabric and a heavy exterior coating make this jacket resistant to chemicals, acids, oils, alcohols, salts, and alkalies The combination of the PVC on polyester acts as a flame retardant. If the jacket catches fire, the flame will extinguish on its own in less than two minutes (once the ignition source is removed). In addition to the outer coating, there is a thinner, inner coating that gives extra protection to both the fabric of the jacket and your own clothing. This hooded acid suit jacket comes in sizes S-4XL. The J41108 is suitable for all rugged environmental conditions, specifically chemical. It is rugged so it's more durable, but is supple enough that it's comfortable to wear all day, if the need arises. For added protection for your hands and arms, the tapered sleeves have elastic inner cuffs that make it easy to slip gloves over the cuffs. Another feature for added protection is a high collar with a hook and loop closure. This gives greater protection to the neck and throat. The hood can be pulled snug around one's head with a standard drawstring. Available in a convenient, easy-to-identify green color.